As a Yorkie-puppy-owner, you might love to keep your pet’s hair long and fancy. But, long-haired Yorkie needs more frequent grooming and care. Hence, the best option is to opt for easy to care style for your buddy. A puppy cut is also known as “kennel cut”. It has shorter than the usual length and all the hair are cut into identical length, which may vary according to your consent. It is easy to maintain and you need less frequent grooming routines than Yorkie with the long hairstyle. 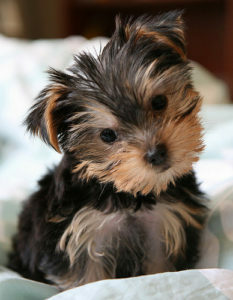 What are the advantages of the Yorkshire terrier puppy cut? The basic advantage of this cut is that it is easy to maintain and needs less frequent grooming and detailing. It is best for the dogs, which are not much comfortable and happy while involving in their grooming tasks. As mentioned earlier, in puppy-cut the length of hair all over Yorkie’s body is the same. However, you have the option to vary it on tail, head-top, face or ears. You can also take the advice of the professional groomer. It is recommended to opt for the cut in which your puppy feels comfortable and needs less frequent grooming. Due to shorter hair length, your puppy remains neat and clean for a longer period. There are two varieties in puppy cut; first is Teddy Bear Trim and the other is Lamb Trim. In Teddy Bear Trim, hair on the coat are cut in similar length, however, round and full on face and legs, giving your puppy a fluffy and cuddly look. It requires a bit more frequent grooming routine. Lamb trim is similar to Teddy Bear Trim, only the hairs are a bit shorter on face and legs, hence, does not need much frequent grooming. It is best for busy puppy-owners. You just need to groom your dog every 6-8 weeks.